From the Southeastern Indian Ocean and Indonesia to Northern and Western Australia: Two semi-permanent weather features can be found across the southeastern Indian Ocean and near Indonesia. By Amanda Delaney, Mark Neiswender & Brian Whitley of Weather Routing, Inc. The first is the equatorial trough that extends from the equator southward to 10S and from 50E eastward along Indonesia and New Guinea. Showers and squalls associated with the equatorial trough generally move westward and are more numerous from January through March. This feature changes little in strength and is quasi-stationary throughout the year. However, over the southeastern Indian Ocean, the equatorial trough can shift farther south a few degrees in the summer and north in the winter. A ridge of high pressure is a semi-permanent feature across the Southeast Indian Ocean. From November through March, the west to east oriented axis of the ridge is found along 32S to 35S and from approximately 50E eastward to 105E. The ridge shifts farther north in June through October along approximately 29S to 32S. At times, portions of this ridge will move eastward across Australia during June through August or further south across the Great Australian Bight from December through February. Winds across the southeastern Indian Ocean from 10S to 20S are generally east to southeast of Beaufort Force 3-5 and swells 5-8ft during the summer months (December through February). However, these winds increase during the winter months (June through August) out of the east and southeast of Beaufort Force 4-6 and swells 6-10ft. The reason for the higher conditions in the winter is due to the ridge of high pressure situated farther north this time of year and interacting with the equatorial trough. Closer to the equatorial trough axis (between 5S and 10S), winds are generally out of the east approximately 1-2 Beaufort Force lower, with swells 2-3ft lower. Outside of any squalls, trade winds and swells are similar across the Java and Banda Seas as described near the equatorial trough across the southeastern Indian Ocean. Winds generally funnel from Torres Strait through the Gulf of Carpentaria and Arafura Sea especially during the winter months. During the summer months, winds are out of the east to southeast Beaufort Force 4-5 (though force 6 to, at times, 7 are more likely near and in Torres Strait). Swells are usually out of the east to southeast of 6-10ft (highest just west of Torres Strait). By winter, east to southeast winds will increase 1-2 Beaufort Force higher with swells building 2-3ft higher across these regions. These surges occur when a ridge of high pressure builds across Australia and interacts with the equatorial trough. The winds are stronger in the winter with these highs shifting farther north over Australia during this time of year. Farther south, a thermal trough of low pressure is usually found along the western Australian coast south of approximately 20S. The movement and strength of the trough will affect the winds and seas along the coast. The approach and passage of any cold fronts and the eventual approach and passage of any following areas of high pressure will result in an offshore progression and weakening of the thermal trough. As a result, southeast winds along the western Australian coast become light and sometimes variable (Beaufort Force 4 or less) along the trough axis. Swells generally lower to southwest 4-7ft with the highest sets farther south during these events. On the other hand, an inland progression and strengthening of the trough can be expected in the wake of these following high pressure areas, as the semi-permanent high pressure ridge builds farther east. This will increase southeast winds to approximately Beaufort, Force 4-6 and southwest swells of 6-10ft (the highest conditions occurring farthest south along the western coast of Australia). Cold fronts are more frequent and stronger during the winter months. These fronts extend as far north as 26S to 28S and reach the southwestern Australian coast every three days. During spring and autumn, these cold fronts are weaker and shift farther south to approximately 28S to 30S. By the summer, the fronts only reach as far north as 30S and pass over the extreme southwestern coast of Australia every four to five days. Ahead of these cold fronts, winds are generally out of the north to northwest of Beaufort Force 3-5 and swells are northwest 4-7ft during the summer. In the winter, the winds will increase out of the northwest of Beaufort Force 4-6 and swells northwest averaging 6-9ft ahead of these fronts. Behind the fronts, winds increase out of the south to southwest Beaufort Force 4-6 and swells build out of the southwest of 6-9ft during the summer. During the winter, winds will increase out of the southwest of Beaufort Force 6-8 and swells build out of the southwest 9-13ft behind cold fronts. However, sustained gale force winds and swells of 10-15ft out of the southwest can develop along the Australian coast south of 25S during exceptionally strong storms. 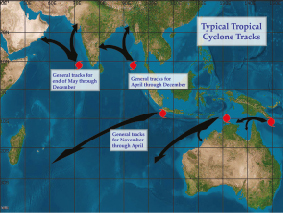 The southeastern Indian Ocean and Australian tropical seasons begin in October and usually end in April, with peak activity in this season typically during February. The majority of tropical cyclone development usually occurs near the equatorial trough, between approximately 06S and 10S, in the southeastern Indian Ocean. Once development occurs, the most likely tracks will be toward the W-SW, along the northern periphery of the semi-permanent ridge of high pressure. Over time, tropical cyclones will usually track more south and southeastward over the southwestern Indian Ocean and weaken over cooler waters between 20S and 25S. Farther east, tropical cyclones generally develop close to and within the equatorial trough near the Arafura Sea and Gulf of Carpentaria. Once a tropical cyclone develops, the system will usually track west-southwestward and will take one of two tracks. The system can track southwestward and make landfall along the northwestern coast of Australia (or in the Gulf of Carpentaria move inland over Northern Territory). The other track is out over the southeastern Indian Ocean with an eventual turn south and southeastward, where the tropical cyclone weakens and becomes extratropical over cooler waters south of 20S. There are times that a tropical cyclone will move inland over the Cape York Peninsula then re-intensify over the Gulf of Carpentaria, before following similar tracks described. Looking farther north, across the Persian Gulf and vicinity, best times will be when weather patterns and regimes are in transition, especially during April May, and during the summer period (May through September), when cold fronts are far less frequent and not as strong. Winter travel will prove more difficult in this region, as stronger NW wind surges and larger NW seas are more common during this period, as stronger, more frequent fronts pass. Elsewhere, within the Red Sea and the northern Indian Ocean, overall the best times of year to make this transit are during April through early May and from late October through November. There are several reasons that these times of year are more favorable to plan a voyage. Spring and autumn are the transitional times between the northeast and southwest monsoons. Winds and swells are generally lowest across the northern Indian Ocean as the wind direction becomes more variable. Across the Red Sea, cold fronts are weaker and higher northwest winds surging across the northern Red Sea occur less often. Also, the thermal trough of low pressure across the Red Sea and Arabian Peninsula is weakening in autumn, allowing for lighter southeasterly winds across the southern Red Sea and through Bab el Mandeb. Across the southeastern Indian Ocean and northern Australia, the trade winds are generally lighter and along western Australia, cold fronts are less frequent and weaker. April and early May also avoid the worst of the tropical cyclone season across the entire region. 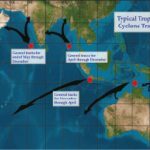 The tropical cyclone season is just beginning across the northern Indian Ocean during this time and, farther south, the tropical cyclone season is winding down near northern Australia. Planning a trip during later October through November does increase the threat of tropical cyclone formation, especially in the northern Indian Ocean. However, a tropical cyclone can be easily avoided as long as one has access to the latest tropical advisories or consults a marine meteorologist prior to and during a voyage. As for routing options, timing will be key for transiting through the Red Sea in order to avoid any wind surges, but once conditions become favorable a direct route to Bab el Mandeb is best. From the Gulf of Aden the best course of action is to transit at least approximately 50 nautical miles north and east of Socotra Island. Not only does this keep the vessel north of residual southwest winds and swells associated with the southwest monsoon, this also minimizes the threat of piracy reported offshore the coast of Somalia. Once the vessel passes this island, a direct route towards the Maldives or southern India is valid. Halfway across the northern Indian Ocean, there are two options to consider especially for a vessel heading to northern Australia. The first is to head directly to the Strait of Malacca. This route will be more favorable for vessels that do not handle larger east to southeast winds, swells and currents that occur across the southeastern Indian Ocean. Also, the tropical cyclone season is more active than usual over the southeastern Indian Ocean during this time as well. However, this route does increase the threat of encountering a tropical cyclone especially in May and November. It is best to keep in mind a place of stoppage, such as the Maldives, in case a system does develop in this region to allow for the system to move safely away from the vessel’s path. Once through the Strait of Malacca, the vessel can then transit directly through the Java, Banda and Arafura Seas to northern Australia. Trade winds and currents across the Java and Banda Seas are generally lighter. However, there still are concerns to consider for this part of the voyage, mainly of tropical cyclone development offshore northern Australia and any enhanced trade winds across the Arafura Sea and near Torres Strait. Additionally, there will be a greater threat of showers and squalls with the vessel transiting close to the equatorial trough. The other option is a direct route across the southeastern Indian Ocean to Australia. This route is better when the northeastern Indian Ocean tropics are more active and minimizes any showers and squalls associated with the equatorial trough. The main concern will be any early or late tropical cyclone development along northern Australia and across the southeastern Indian Ocean but these systems develop less frequently during the spring and autumn. Planning a transit during the winter months across the Red Sea and northern Indian Ocean is not ideal with higher north-northwest winds and swells across the northern Red Sea and higher north-northeast winds and swells across northern Indian Ocean. Currents are less favorable too, with mainly east to northeast currents across this region. If a vessel must depart during this time, be prepared for long delays and numerous stoppages to wait for a brief break in the northerly wind surges. The best action from the Gulf of Aden will be to head north of Socotra Island, and then take a best southeasterly heading towards the Maldives; however, north-northeast winds and swells will be strong. The winds and swells will slowly improve towards the Maldives, with either direct routing to the Strait of Malacca or across the southeastern Indian Ocean to Australia remaining valid. The only problem heading to the Strait of Malacca is the large northeast swells propagating southward from the Bay of Bengal. Once in the southern hemisphere, tropical cyclones will become a greater threat and will have to be monitored with greater care. It is usually not recommended to plan a trip across the northern Indian Ocean during the summer months. Sustained gale force winds, large southwest swells, and a strong Somalian current in the Arabian Sea, plus the threat of tropical cyclones will make the transit extremely uncomfortable and, at times, can be dangerous especially for smaller vessels. Long delays are likely and window to transit across this region are few and far between. Even if the vessel does make the transit and arrives in the southeastern Indian Ocean or across the Arafura Sea, trade winds will be more enhanced across this region, as well as large southwest swells propagating northeastward from storms in the southern Indian Ocean to further hinder the transit. It is recommended to avoid transit across the northern Indian Ocean to Australia from the end of May through to September. Having this basic weather information and knowing when to plan for generally the best conditions at hand will give a mariner a better idea of what to expect while navigating across the Indian Ocean. However, the weather does not always go according to plan and it is best to have access to the latest weather information on board the vessel or to consult a private weather company, such as Weather Routing Incorporated, where marine meteorologists can monitor the weather and advise of any route alterations in order to avoid heavy weather. This way a mariner will have peace of mind knowing what lies ahead and can confidently steer for clear skies.